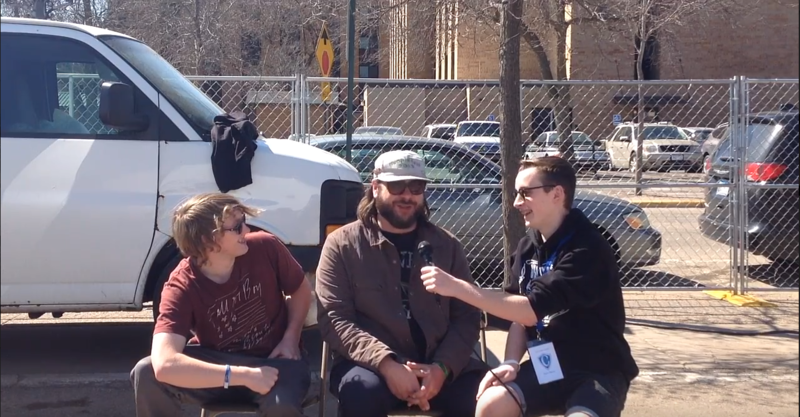 Teen Press students from Cotter School interviewed musicians and fans at Mid West Music Fest 2018 in Winona as part of the Sounds Like School program. Click the links below to check out their amazing work. As part of Mid West Music Fest’s Sounds Like School Program, Riveryway Community School’s Teen Press interviewed Margaret Butler from the band GGOOLLDD before a performance at the Root Note in La Crosse, WI. Lillian Whetstone (left) and Zane Al-Saeed (right) with Margaret Butler (second from right) Photo by Shantia Smith. We, Lillian Whetstone and Zane Al-Saeed from Riverway Teen Press interviewed Margaret Butler, frontwoman for the band GGOOLLDD from Milwaukee, WI accompanied by her adorable ageing chihuahua, in the random, homey basement lounge of the Root Note, in La Crosse, WI. Prior to her sold out show, we talked goals, fashion choices, and the cover of their new album TEETH, for which they are currently on tour. TEETH will be released December 1st, 2017. Go check it out here: https://ggoolldd.bandcamp.com/. Lillian: You played the Turner Hall Ballroom last year, and it looked like an awesome experience. Could you tell us about that? Margaret: I’ve played it the past few years. We do one show a year there. We are actually doing another one this New Year’s Eve, so that’s really exciting. It’s really fun. I remember being there, and I’d have all these goals for myself as far as like where my band’s going to go, and for everything I do. Yeah, it’s fun to set goals for yourself. I remember being there and seeing another band that was like, a local band and saying to myself, “Man, I can’t believe they’re playing Turner Hall. That’s so cool.” And I thought to myself, “By the time we are one year old we will be playing Turner Hall.” Then after nine months of being a band together we were there, and I was so excited and so proud of us, but it did take us another two years before we could actually sell it out. But just playing there for the first time was so exciting, and playing there three months ahead of schedule! I was very pumped for that, so then going and of course we weren’t headlining, we were like opening for other bands, but then being there and just knowing that I sold out that whole room myself with my band, it was the most proud experience that I’ve had in the career of music. It was just like, we did all of this. We did all of this by ourselves. Zane: I noticed that today you are playing a smaller venue. Would you prefer to play in front of a small group of people or play a big show with a couple thousand people? Margaret:Well I don’t think it matters as long as the room is full. It’s going to be the same experience. Because the depth of people around is what’s important, like the people in front of you dancing, and you can only see like the first thirty or forty people in front of you either way. And it’s the look on their faces is what makes your show a good show or a bad show. But as far as playing to 1,000 people versus fifty people, if the room is full and the people are just as excited to be there, that’s what makes a great show. Lillian: Does your success surprise you? If your past self saw you now, how do you think that she would feel? Margaret: I think she would be pretty surprised at what I chose to do or how I even got here, you know what I mean? Like I said, I didn’t start with this. I never intended on being in a band. I just wanted to throw a halloween party. So I wrote some songs with a dj friend, and we just threw a halloween party, and people just kept on asking us to do stuff and so we were just like, “Okay.” So yeah I would be very surprised that I ended up being in this position in the first place honestly. But as far as being successful, I don’t know what that is. I’m happy, I think I’m doing okay. Zane: What advice would you give to beginner musicians that are nervous and scared that want to be like you? Margaret: I would say stop being scared. I mean, whatever that takes. Honestly for me, it took a lot of whisky. It was awful (laughs). It was so bad. I mean, I never even sang into a microphone. I just got drunk and then I was like, “Yeah I’m going to do it.” And after I did the initial thing it was okay. I’m not saying get drunk and face your fears, because if your fears are driving a stick shift, well then you’re in trouble. But what I’m trying to say is lean on your friends, lean on people who tell you that you are going to do it. But, I mean everyone deals with fear differently. Lillan: Do you dress the same in daily life like you do on stage? Margaret: Depends on the day. I mean if I do go out in sweatpants I make sure they’re sweatpants that can be worn with heels. I always have to be ready to glam up. Like I said, dressing up is such a process for me because when I dress up, it makes me feel more stage ready. I wouldn’t say I dress as fancy as I do on stage, with like all the glitter, but I’m always wearing things like over exaggerated heels and a fur jacket. It’s always as eccentric, I wouldn’t say it’s as glam though. Lillian: What was the inspiration for the cover of your album, TEETH, that you are going to release? Margaret: This is actually a little boy, he is his nephew, Harvey Spears. I don’t know it’s like a weird. For the album TEETH we are going for a little grittier of a feel because up until now it’s been very, very pop-y, and I didn’t have very much control of the music before, because you know we changed band mates a little bit, so I have been wanting to write a little bit more rock style. Still I love pop music, and I just wanted to make it a little bit grittier, hence the name TEETH. This kid, he’s like dressed like me. I actually brought my wardrobe to this child and I was like, “Take whatever you want, and you wear it,” and it was a deal: “If I get to do your makeup, then you get to do my makeup,” and he was like, “Okay”. Zane: How did the makeup look in the end? Margaret: On me? Terrible. He looked great though! (laughs) He tried to draw a heart out of pink lipstick on my face, and he tried to put eye make-up on me, but it was just like black lines. It was just ridiculous. Then I had to go out for eight hours in public. (laughs) We had to go to different spots for different shoots. But it turned out really well because as you can see we are outside this shotty (expletive) motel and he is just so downtrodden, and he is trying his best in his superhero cape dressed up in all of my costumes. And you can tell that he feels like this person is his superhero that he is trying to emulate. You can tell he is just like in a (expletive) situation that he is trying to get himself out of. It was just like what I was sort of doing in that transition when we wrote this album, so it matches up well. Zane: So I notice on your bio you have a art degree. What kind of degree is that? Did this have any effect on you becoming a musician? Margeret: Jewelry design. Yeah, my father’s a jeweler and I have actually been making jewelry since I was twelve. So I was like, “Okay, my parents are making me go to college immediately, and this is the thing that I know the best.” So I went, but I didn’t like it. I don’t like sitting in a damn desk all day. It’s too dull for me. I cannot do that. So I started designing clothing because I had the design part in me. So I tried designing clothing and I was pretty good at that, and so I started a store. And in the middle of that, I started doing this, and I am better at this than that, and you know one day I might find something else that I am better at than this, and then switch over to that. Mid West Music Fest Tasting & Fundraiser March 30!